Originally conceived as a fun, exploratory CD designed to teach some of the most difficult topics in introductory psychology in a more fun and engaging way, version 2.0 continues its theme of getting students "hooked" on psychology. There are four main sections to the CD: 1) Interactive Modules, each with a consistent structure: "Explore" introduces the topic in an interesting way; "Lesson" elaborates on topics; and "Apply" offer hands on activities to test understanding. 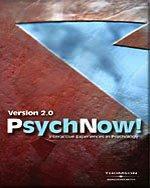 2) InteractNow!, Team Based On-lineWadsworth Publishing is the author of 'PsychNow! CD-ROM Version 2.0: Interactive Experiences in Psychology', published 2003 under ISBN 9780534590468 and ISBN 0534590462. Loading marketplace prices 3 copies from $8.16 How does the rental process work?